Since 1988, A&B Accessories has manufactured high quality casual furniture for customers around the world. 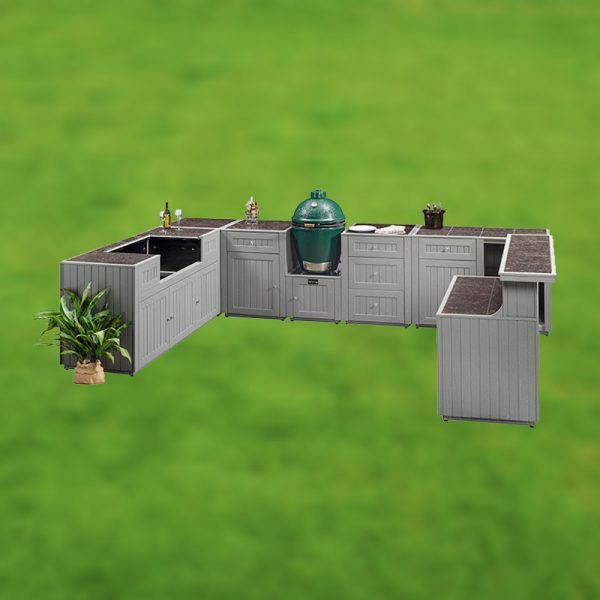 Our outdoor kitchens continue this tradition by using materials best suited for their environment. The cabinet base is made of Envirotech — a 100% post consumer recycled product made in the USA. This material will not fade, crack, or deteriorate. It requires zero maintenance and the wook grain texture and design blends with any decor. The wood grain texture and excellent design blends with any decor. Our drawer slides, pulls, and hinges are made of 304 stainless steel — the highest quality available. You can be assured of excellent performance in the harshest conditions. All units are available in Deep Redwood, Costal Gray, and Chestnut with British granite tops.